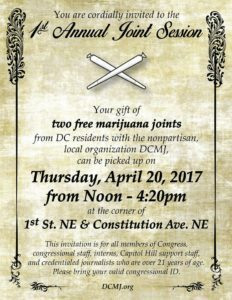 Join DC resident with DCMJ for the 1st Annual Congressional Joint Session! We are giving away TWO FREE joints to all members of Congress, congressional staff, interns, support staff, and credentialed journalists who are 21 years of age and in possession of a congressional ID. WHO: Supporters of congressional cannabis reform and those with valid congressional IDs who are 21 years of age or older. WHY: We want members of Congress, congressional staff, interns, support staff, and credentialed journalists to legally obtain cannabis so they will support removing cannabis entirely from the Controlled Substances Act. Moreover, we are demanding Congress remove the DC rider that prevents the DC government changing it’s cannabis laws.